The earth is the third planet planet from the sun, and the densest planet in the solar system. It was formed over 4 billion years ago after the big bang, and initially had little nutrients for life to exist. The earth is always interpreted in many different ways. However, there are generic characteristics such as 3,929 miles in radius, 5.97*10^24 kilograms, and a gravity of 9.81 m/s. The earth has only one moon, and has a rich history of human conflicts, exploration, and evolution. Why are the planets in the solar system sherical? Because the force of gravity, pulled this molten material inwards towards the planet's center into the shape of a sphere. Because of the tilt in the planet. Our energy primarily comes from the sun. It heats naturally heats our environment and provides electricity for houses and area. There are light years because that is the distance light can travel in a year. 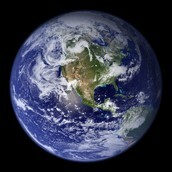 Once you arrive in earth, you should explore every country because every country has different cultures and creatures. For example, China has animals and a culture different from that of America. If you come to earth, you can see thousands of cultures,religions, countries, and food. The people all have unique talents and beliefs that will make you think different about other planets. The weather brings diverse nature to every area of the planet, and there is no disappointment on any place on this earth.